I am really under the weather. Hope to see you next week. In the meantime, take a stroll through my flickr page for some pastry inspiration! We all know the composition of German Chocolate Cake: rounds of soft chocolate cake layered with a filling of toasted pecans and shredded coconut in a rich caramel. It’s called “German” not because it originates in Germany but because of Sam German, an American chocolatier who created the cake in the mid-1800s. 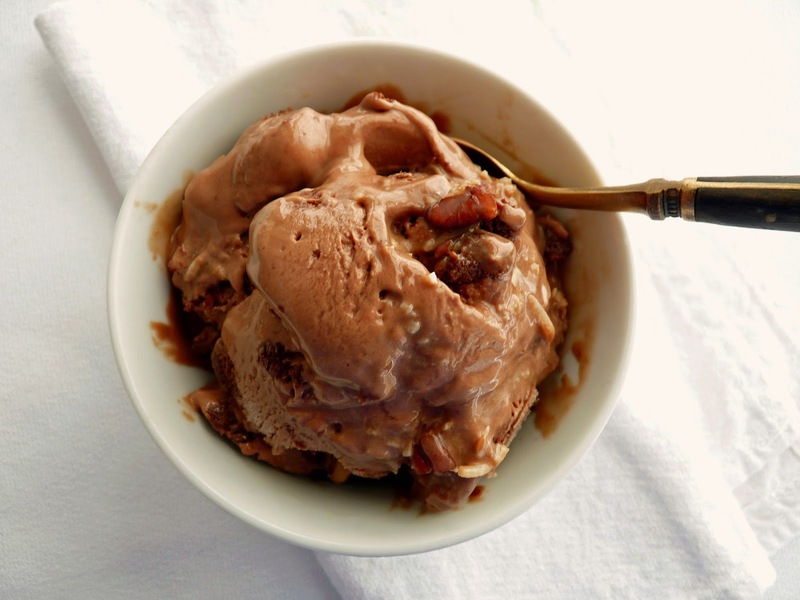 German Chocolate Cake translates easily into an ice cream flavor. I’ve dialed down the intensity for those who enjoy the idea of German Chocolate Cake but find it delicious only in small doses. The ice cream is a deep chocolate blend. Toasted pecans and coconut are combined with a bit of very simple brown sugar caramel. Chunks of chocolate cookies are added for more texture and more chocolate depth. And although it’s not quite as rich as the cake version, all the essential flavors are there for a very delicious ice cream experience. 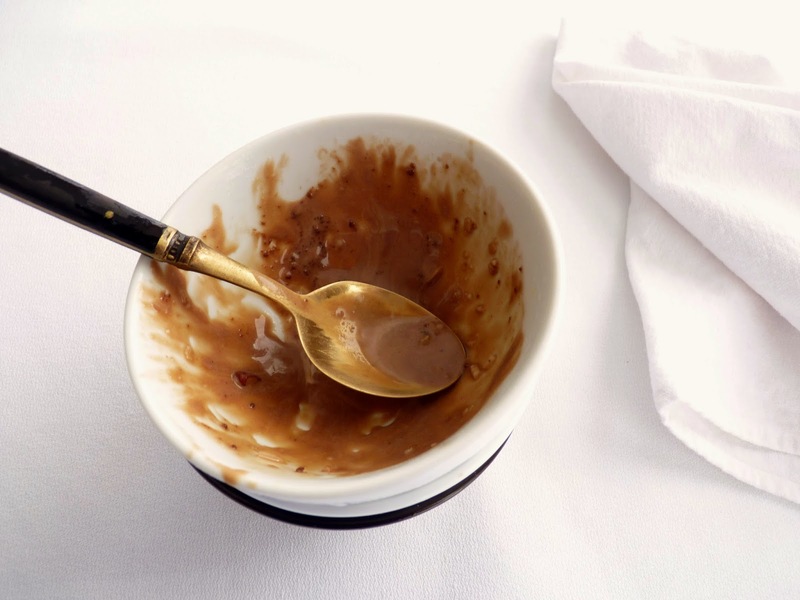 - When melting the chocolate, make sure the bottom of the bowl is not touching the barely simmering water in the bain marie. - Place the pecans in a single layer on a baking sheet and toast at 350 degrees F for about 10 minutes. 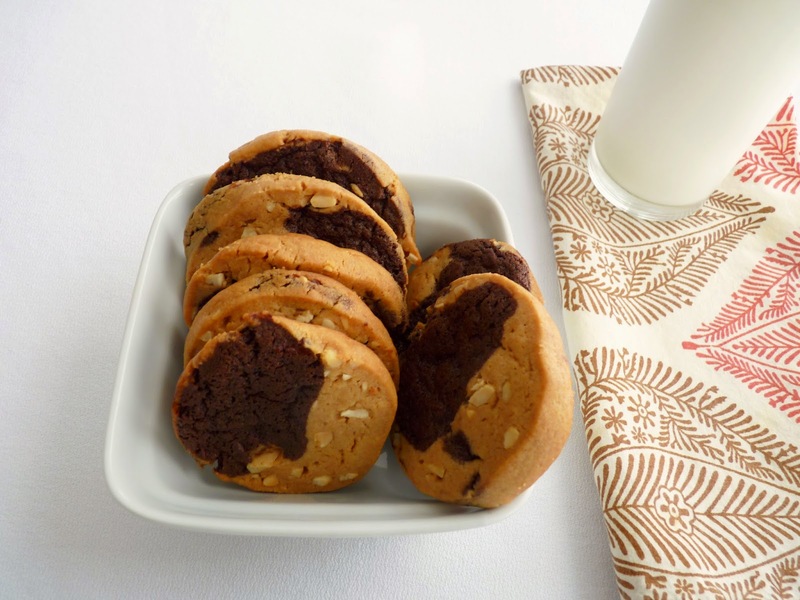 - Choose chocolate cookies that are soft so they’ll be a bit chewy. I used Saucepan Fudge Drops and I thought they were perfect. - Change up the pecan, coconut and cookie proportions to your liking. 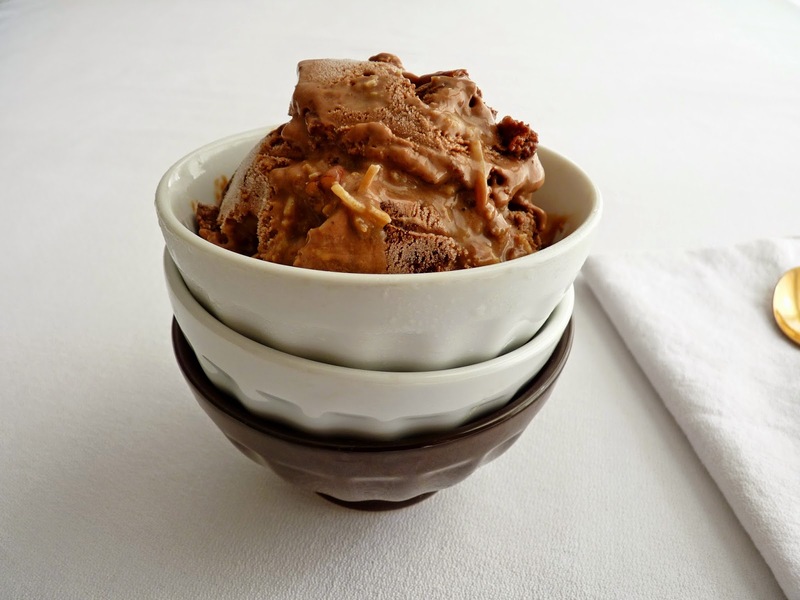 - Let the ice cream sit at room temperature for about 5 minutes to soften before scooping. For the ice cream base, chop the chocolate into small pieces. Combine with the heavy cream in a heatproof bowl and warm over a bain marie of slow simmering water until chocolate is melted. Remove from heat and stir until smooth and thoroughly combined. Set aside. Bring the 1 1/2 cups of milk to a simmer. Whisk the egg yolks with the sugar until thickened and light yellow. Add some of the warm milk to temper the mixture, whisking constantly. Pour in the remaining warm milk and whisk together thoroughly. Return the mixture to the pan and place on medium low heat. Cook, stirring constantly with a heatproof rubber spatula or wooden spoon, until the custard coats the spatula or back of the spoon and a finger traced through it leaves a clean track. Do not boil. Strain immediately into the chocolate/cream mixture and stir to combine. Add salt to taste. Cool and refrigerate until thoroughly chilled, preferably overnight. For the pecan and coconut caramel swirl, place the cream and brown sugar in a saucepan over medium low heat. Bring to a slow boil for about two minutes or so until the sugar is dissolved, whisking constantly. Take off the heat and add vanilla and salt, to taste. Stir in the chopped pecans and coconut. Chill just until the mixture thickens. Chop the chocolate cookies into bite-sized pieces. Freeze the ice cream according to your machine’s directions. Fold in the chopped chocolate cookies. Pour half the ice cream into an airtight container and dollop half the pecan coconut caramel mixture. Take a knife and swirl it through. Repeat with a second layer of each, pressing and swirling the nut mixture into the ice cream. Press a piece of plastic wrap onto the surface of the ice cream, cover and place in your freezer to firm up. This is a back to basics kind of week. Nothing very fancy or complicated, just simple ingredients you can find just about anywhere. But since it’s also essential to have some fun in the kitchen, I mix things up just a little bit. 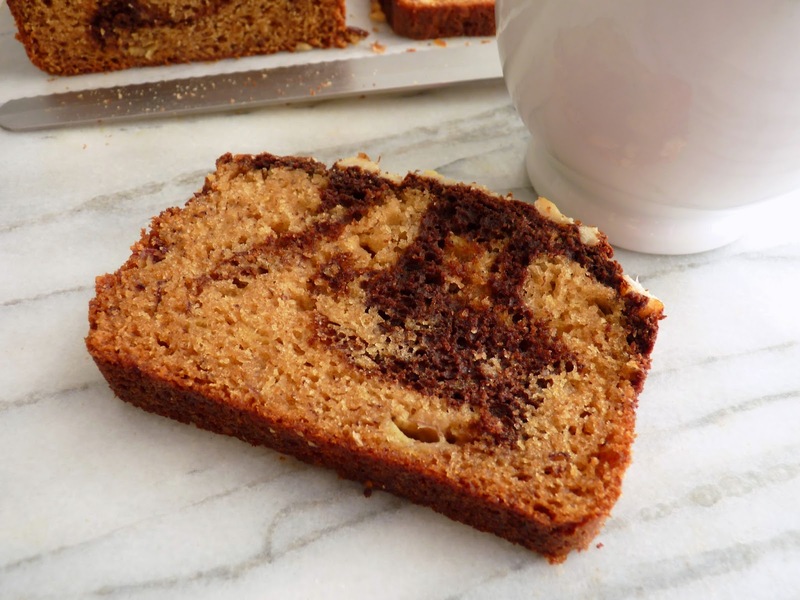 I start this pastry with a basic banana bread idea, which we all know and love. 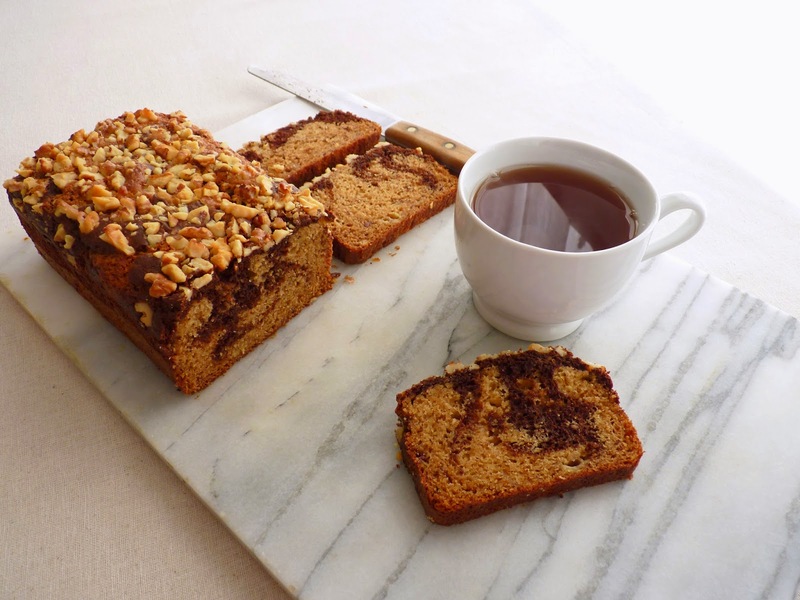 Some banana breads are made with butter and some are made with oil. Some have nuts and/or chocolate chips. Some are hydrated with buttermilk and some just use a lot of bananas for more moisture. In this recipe I brown the butter to a nice nutty amber for additional flavor. I add a pinch of spice and I use sour cream for moisture. I’ve found that sour cream works best to really tenderize banana cake. I use a mix of granulated & brown sugars for flavor and moisture. I add bananas that are very ripe to make sure the right sugar levels are there. And just to make matters more alluring, I portion a bit of the batter and flavor it with a cocoa & coffee mixture. Then it's crowned with chopped nuts and into the oven it goes. 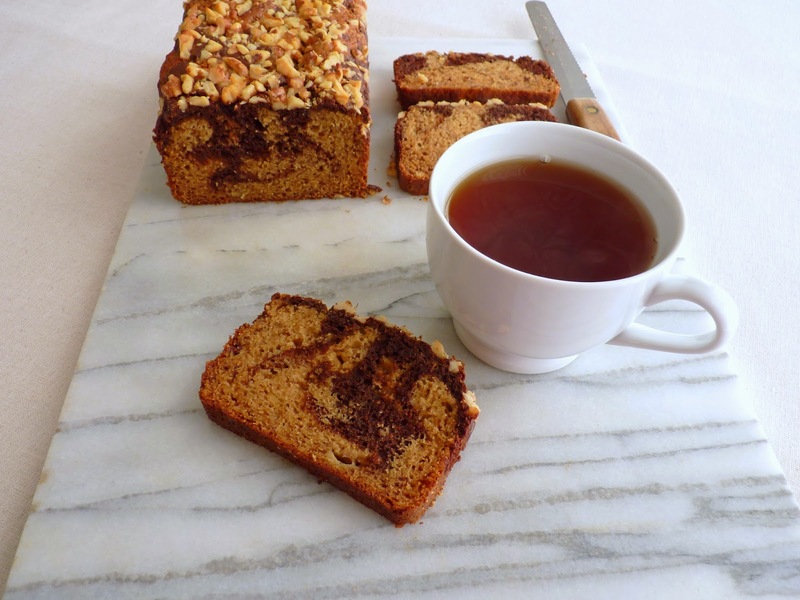 The resulting cake is tender with a soft crumb, not too heavy and perfect for an afternoon snack or morning brunch table when you feel like it's time for a little treat. 1) Use a stainless steel pan so you can best gauge the color of the butter as it starts to brown. Have a small heatproof bowl near the stove so you can immediately pour off the butter when it's done. I use a clear Pyrex custard cup so I can see the color. 2) Cut the butter into small uniform pieces so it melts consistently without spot scorching. 3) Use medium low heat and watch it carefully. As the butter starts to melt and heat up, you'll notice small bubbles on the surface that get larger. You'll notice the milk solids starting to brown on the bottom of the pan very quickly. Lift the pan and swirl for more control if it’s browning too fast or nearly done. Keep your eye on it and keep swirling. It will be done very quickly after you notice the first brown bits on the bottom of the pan. Once you begin to detect a nutty aroma, it's about done. Stop when you think it's almost there. It will continue to darken off the heat. Pour immediately into a heatproof bowl to stop the cooking. Set aside to cool. - I mashed the bananas fairly coarsely. It's definitely not a puree. 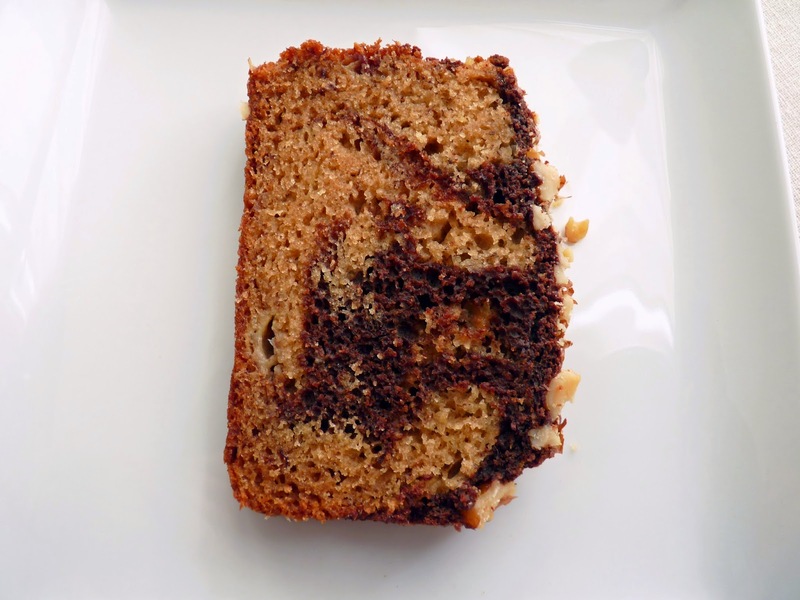 - I tried this cake with melted chocolate rather than the cocoa mix and I prefer the flavor of the cocoa. Preheat oven to 350 degrees F. Grease an 8 1/2" x 4 1/2” loaf pan and line with a piece of parchment paper large enough to form an overhang along both sides of the length of the pan. Brown the butter until it’s medium amber. Immediately pour into a heatproof bowl and allow to cool. Sift together the flour, baking powder, baking soda, salt, cinnamon and nutmeg. Set aside. Combine the cocoa powder with hot coffee until smooth. Set aside. In a bowl large enough to hold all the batter ingredients, whisk together the cooled browned butter and both sugars. Beat in the eggs and vanilla extract and mix thoroughly. Add half of the flour mixture and stir to combine. Blend in the sour cream and bananas and mix thoroughly. 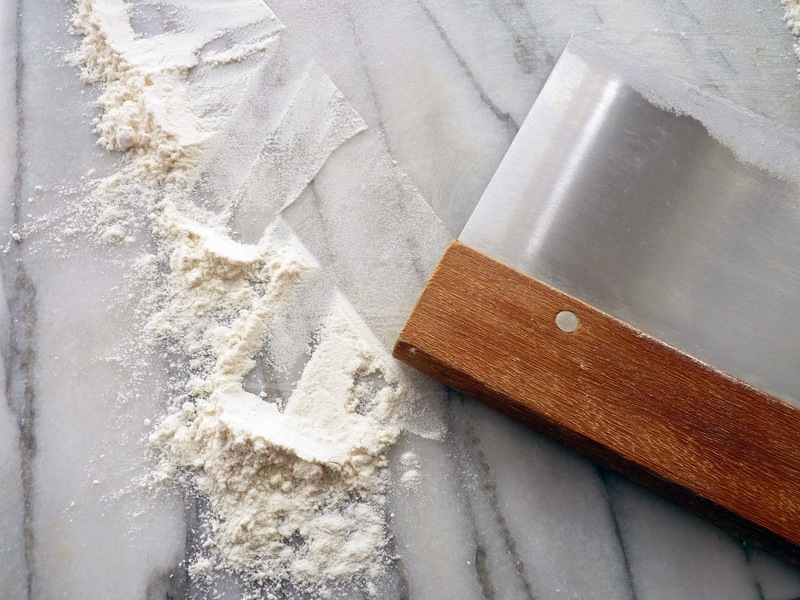 Add the remaining flour mixture and mix just until there are no more flour streaks. Remove 3/4 cup of the batter and combine with the cocoa/coffee mixture. Pour half the banana batter into the prepared pan. Dollop with half the chocolate batter and run a knife through in figure 8s to marble. Repeat once again. Press chopped nuts onto the top. Bake for 45 - 50 minutes or until a toothpick inserted into the center of the cake comes out clean. Place cake on a wire rack to cool for 10 minutes. Run a thin knife around the edges to loosen. Using the parchment overhang to assist, lift the cake out and cool completely. 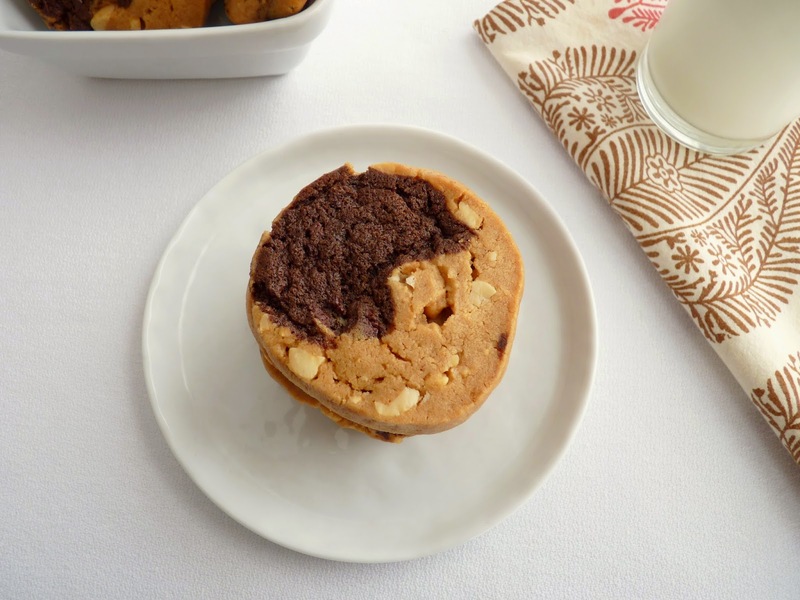 When you can’t decide between two different cookies, I think it’s only fair to compromise. Make a little of both and simply twist them into an interesting Rohrschach Test collection. And since chocolate and peanut butter are such good buddies, I co-mingle them here in this very-easy-except-for-the-dishwashing recipe. When you work in a professional pastry kitchen, one of your best buddies is always the dishwasher. They are in charge of keeping all our bowls, sheet pans, utensils and tools squeaky clean and are usually cranking on full-speed to keep up with production. They are the people who make everything possible. Any kitchen worth its salt knows and recognizes the value of a good dishwasher. This twist is basically two separate cookies that are melded together to form one delicious taste of both. Although it requires a few bowls to get the job done, by all means, don’t let that hinder your progress. These soft and chewy bites are the best of both worlds, a worthy compromise. - This is a recipe where you have to make sure to keep your mise en place separate for each dough. That’s where all the bowls come in! - This recipe makes a lot of cookies. You can store well-wrapped logs in the freezer for later. I’ve also halved the recipe. To divide the egg, I scramble it and then split it in half using a scale. Most large eggs are about 54 grams, so I use about 27 grams for each dough. Sounds crazy but it works. - When mixed, the doughs will be too soft to shape, so chill them both until they feel like they can withstand handling, about an hour or two. Work quickly to form the logs then chill again when the logs are formed. I usually leave the logs to chill overnight or a couple of days. - I work with four pieces of 8” x 12” parchment to form and shape the dough into four 8” logs, use it to roll up the logs and then wrap with a layer of plastic to chill. You can also divide each dough in half and form just two logs that are about 11 1/2” if that’s easier for you to handle. - When I’m done with a roll of paper towels, I take the cardboard cylander and use a box cutter or pair of scissors to cut it open. I slip the formed and wrapped cookie logs into the cardboard and then chill. This helps to keep the round shape. - Cookies will be soft to the touch when they are removed from the oven but firm up as they cool. 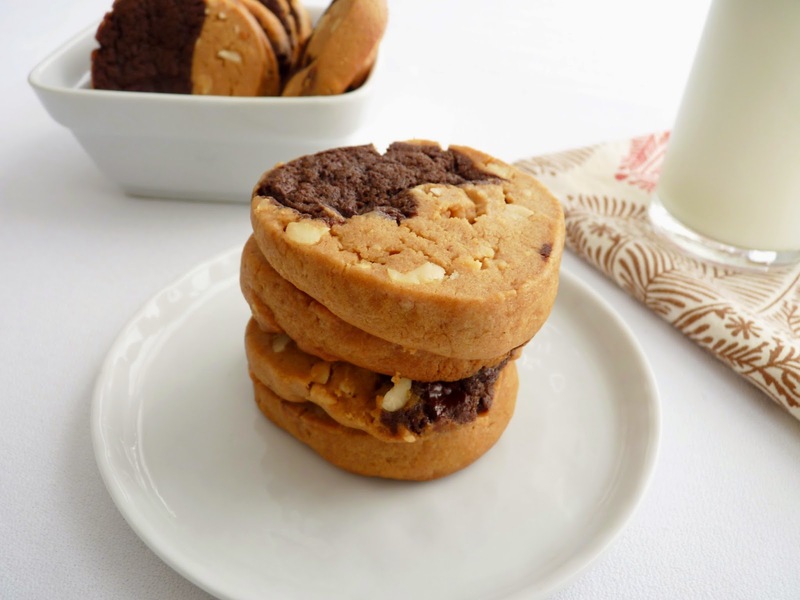 - For another take on peanut butter cookies, try Peanut Butter & Jam Cookies, Peanut Cookie Brittle or Oatmeal Peanut Butter Sandwich Cookies. For the peanut butter dough, sift the flour, baking soda, baking powder and salt and set aside. Cream butter and sugars until light, about 2 – 3 minutes. Add peanut butter and vanilla and mix thoroughly. Scrape down the bowl. Add the egg and mix until thoroughly blended. Add dry ingredients (and chopped peanuts, if using) and mix until there are no streaks of flour, scraping down the bowl as necessary. Place the dough on a piece of plastic wrap and chill until firm enough to handle, about 2 – 3 hours. For the chocolate dough, sift the flour, cocoa, baking soda and salt and set aside. Cream the butter and sugars until light, about 2 – 3 minutes. Scrape down the bowl. Add the egg and vanilla and mix until thoroughly blended. Add dry ingredients and chocolate chips and mix until there are no streaks of flour, scraping down the bowl as necessary. Place the dough on a piece of plastic wrap and chill until firm enough to handle, about 2 – 3 hours. When the dough has been chilled, divide each packet in four equal pieces. Press each piece into a flattened log about 7” long. Work with one piece of each cookie dough at a time, placing the remaining logs in the refrigerator to keep them chilled. Take one of each log and stack them together. Gently twist them a few times until they are fairly marbled. Roll into an 8” log. Wrap tightly and chill thoroughly, preferably overnight. Repeat with remaining dough. 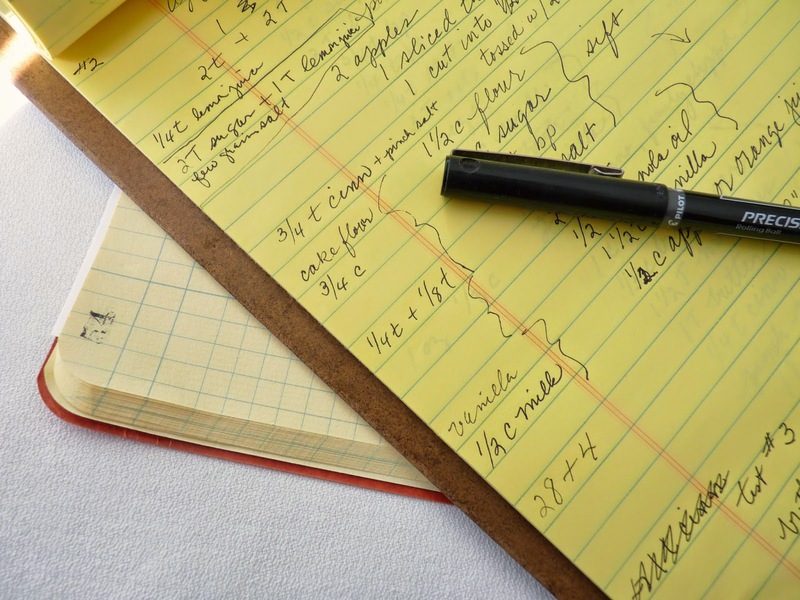 When ready to bake, preheat oven to 350 degrees F. Line baking sheets with parchment or silpats. Use a sharp knife to cut cookie log into 1/2” slices. Place them about 2” apart on baking sheets. Bake for 13 - 15 minutes. Cool baking sheets on wire rack until cookies are firm enough to remove. Store the cookies in an airtight container.